A complete medical evaluation for tuberculosis (TB) includes the following: (1) Medical history, (2) Physical examination, (3) Tests for TB Infection, (4) Chest radiograph, and (5) Diagnostic microbiology. Tuberculin skin testing (TST) is the most common method used to screen for latent M. tuberculosis infection (LTBI). In 2001, an interferon release assay (QuantiFERON-TB test) was approved by the Food and Drug Administration (FDA). Active tuberculosis (ATB) is considered as a possible diagnosis when findings in a chest radiograph of a patient being evaluated for respiratory symptoms are abnormal, as occurs in most patients with pulmonary tuberculosis (PTB). The radiographs may show the characteristic finding of infiltrates with cavitation in the upper and middle lobes of the lungs, including clinical suspicion and response to treatment. Traditionally, the first laboratory test used to detect ATB in a patient with an abnormal chest radiograph is examination of a sputum smear in search for acid-fast bacilli (AFB). 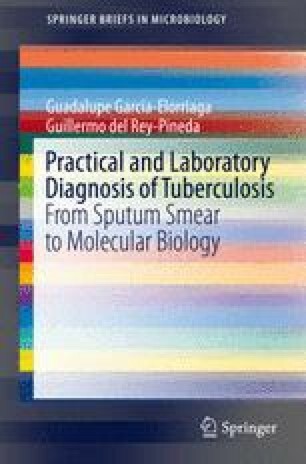 Definitive diagnosis of TB requires the identification of M. tuberculosis (MTB) in the culture of a diagnostic specimen. The most frequent sample obtained from a patient with a persistent and productive cough is sputum. Sputum is obtained by bronchoscopy and bronchial washings or bronchoalveolar lavage. Newer and faster MTB diagnostic techniques include nucleic acid amplification (NAA) tests. With molecular biology methods, DNA and RNA are amplified thus facilitating rapid detection of microorganisms; these tests have been approved by the FDA. Biopsy and/or surgery are required to procure tissue samples for diagnosis of extrapulmonary TB (EPTB). Ozkaya S, Bilgin S, Findik S, Kök HC, Yuksel C, Atıcı AG. Endobronchial tuberculosis: histopathological subsets and microbiological results. Multidiscip Respir Med. 2012;7:34. http://www.mrmjournal.com/content/7/1/34. Accessed 19 Feb 2014.